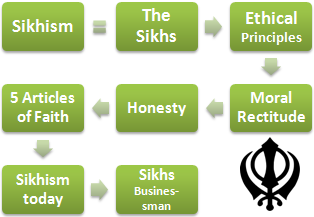 Syllabus of the Online Course (Subject): Sikhism (Sikh Dharam) and business (India). Sikhism, or Sikh Dharam, is a religion founded by Guru Nanak between the XVI and XVII centuries in India, in the actual state of Punjab, when Islam dominated the region, and the clash between Islam and Hinduism was common. Sikhism is a syncretic religion with Hinduism and Islam values. “There is neither Hindu nor Muslim, but the only man. So whose path shall I follow? The Guru Nanak is revered today by the vast majority of the Indian Muslims and Hindus. With more than 25 million followers worldwide, Sikhism is one of the World's great religions. While the number of followers is small compared to other faiths such as Christianity, Islam, or Hinduism, its involvement in international business, politics, science, and culture is crucial. Perhaps the most significant fact of the Sikh influence is that former Prime Minister of India is Sikh because Sikhism is respected by Hindus and by Muslims. Sikhs have solid ethical principles, proof of this is that major multinationals have hired senior managers and directors to Sikhs. The high moral rectitude and honesty tend to be a feature of the Sikhs in business. 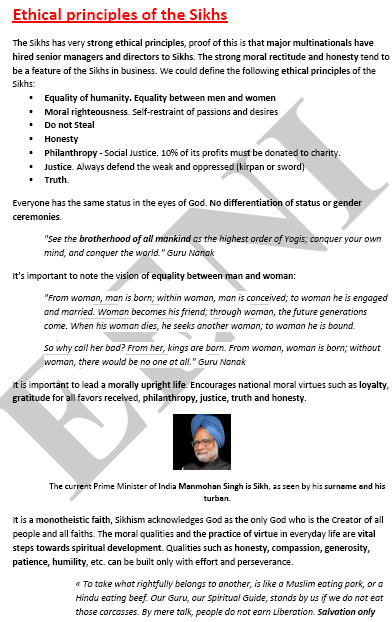 The “Rehat Maryada” is the Sikh code of conduct. The word “guru” in the jargon Sikh means “an illuminator and a prophet.” The Ten Gurus founded the Sikhism. The first, Guru Nanak (1469-1539), rejected the ritual practices of the dominant religions in South Asia and based his message strictly on divine revelation. The tradition tells us that Guru Nanak travelled throughout India, Persia, the Arabian Peninsula to Mecca. On these trips made speeches addressed to any believer either Muslim, Jain, Zoroastrian, Hinduism or Buddhist.